I love cheese. Cheese will forever remain in my “favorite food” category. Need proof? See here, here, here and here. I also love the Oscars–the red carpet, yelling at the TV: “Giuliana, eat a cheeseburger!”, the gowns (excited to see Lupita’s choice), the acceptance speeches, the upsets, Leonardo DiCaprio…oh, THE DRAMA! 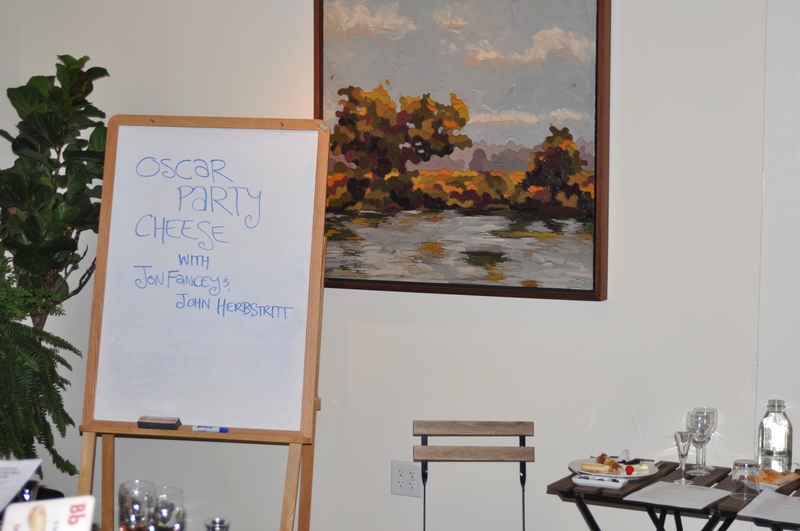 So, when I saw that the Cheese School of San Francisco was bringing back the Oscar Party Cheese: Triple Cremes, Bubblies, & Surprise Wins, you bet I registered for the class. 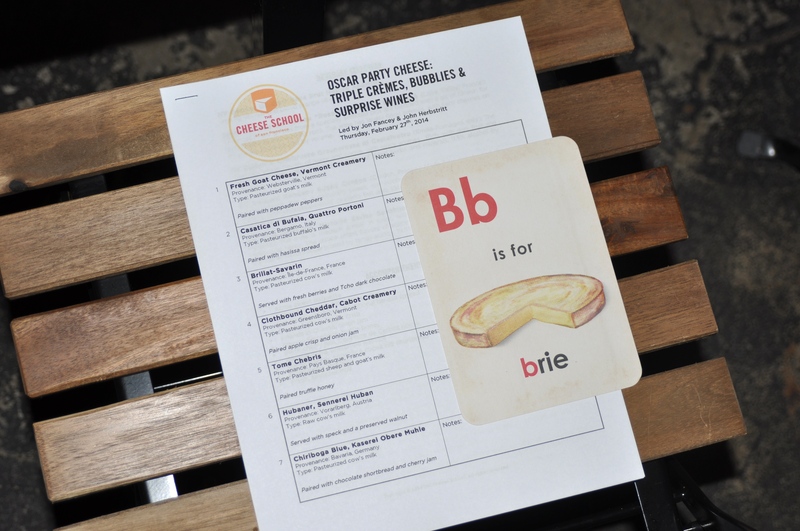 Cheese Plus’ Jon Fancey & Bi-Rite’s John Herbstritt shared their favorite, award-worthy cheeses and the wines and goodies with which to pair them. If you’re hosting an Oscar party or just having a quiet night at home, you’ve come to the right place. 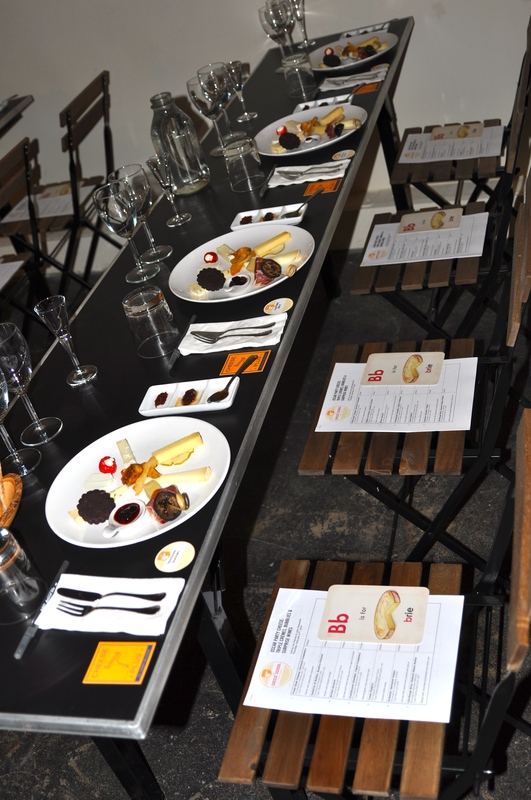 – ‘Which cheese would you take home with you this evening…?’ Be able to educate you guests about the cheese your serving. – ‘Is there anything special in the case today I should try…?’ It’s important to buy your cheese from a cut-to-order counter. – ‘Anything unique I could serve with this cheese…?’ See below. – ‘Any tips on serving this cheese in a special way…?’ Invest in a good cheese board; the knives don’t matter as much. We started the night off with a piece of Point Reyes Toma from Cowgirl Creamery, a cheese I always have on-hand at home. This is the perfect everyday cheese and I recommend starting with this at your Oscar party. Serve it with a Lagunitas beer and the men will be happy too! 6. Hubaner, Sennerel Huban served with speck and a preserved walnut. Cheese Plus is about the only store in SF where you can buy this cheese right now. The cheese is from a small producer in Vorarlberg, Austria and only one distributor in New York has this cheese. Good news: it’s growing in popularity so it should be popping up more in cheese stores. 7. Chiriboga Blue, Kaserel Obere Muhle paired with chocolate shortbread and cherry jam. This was an incredibly well-rounded blue cheese and the entire class loved the milkiness. – Go beyond your own personal tastes. – Go BIG. Nothing makes more of a statement than one large piece of cheese, whether it be a beautiful slab of Gruyere or a whole round of Brilliat Savarin. 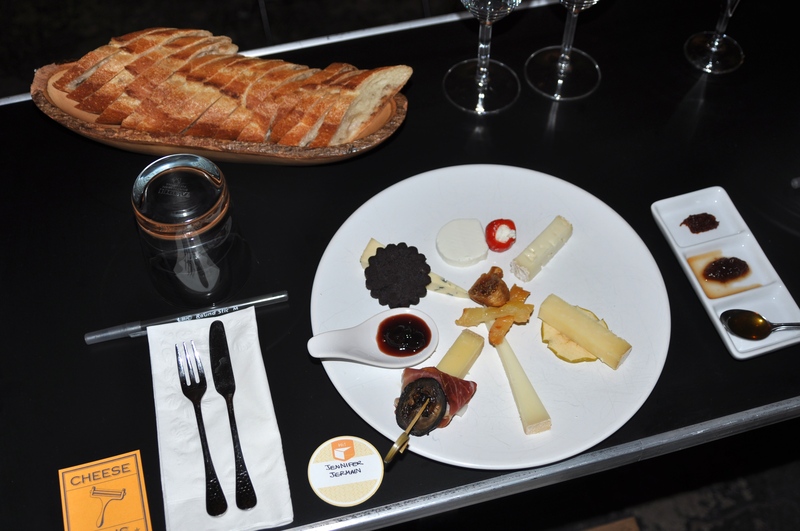 Instead of serving four cheeses with one standard accompaniment, try one cheese with four unique accompaniments. – Select unique accompaniments. Have I driven this one home yet? – Use an appropriate surface to serve cheese. A good tip we learned: random pieces of marble, slate or granite are readily available at Home Depot and make great cheese boards. – Learn something about the cheese your serving. – NV German Gilabert Cava Brut Nature Aperitif served in a shot glass with fig vinegar and blood orange olive oil to kick the party off. So delicious and unexpected. – 2010 Chateau du Hureau “Rosanna” Saumer Brut Rose from Loire Valley, France. It contains a blend of Cabernet Franc grapes and Chenin for a refreshing and exciting rose. This was my favorite wine we tasted. – NV Barbolini Lambrusco Grasparossa di Castelvetro from Emilia-Romagna, Italy. The wine has simple flavors of berry and cocoa, with spicy aromas. – NV Bernard Rondeau Bugey Cerdon from Cerdon, France. Ideal for an early evening aperitif or served with chocolate-based desserts. – NV Rare Wine Co. Historic Series Savahnnah Verdelho Madeira from Portugal. Cheers to a fabulous Oscar night! A big thank you to John and John for teaching such a fun and informative class last night. The Cheese School of San Francisco just announced their Spring schedule and you can check it out here.